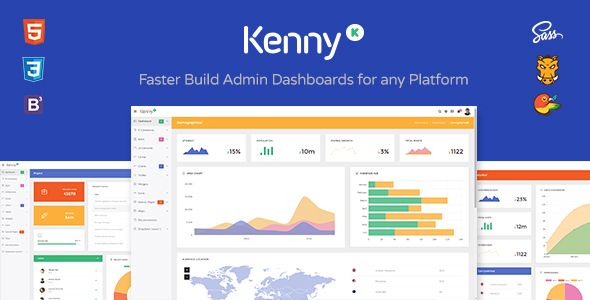 Kenny Admin is a WebApp template for admin dashboards and control panels. It is a responsive HTML template that is based on the CSS Sass framework Bootstrap 3.3.6 It utilizes all of the Bootstrap components in its design and re-styles many commonly used plugins to create a consistent design that can be used as a user interface for backend applications. Kenny Admin is based on a modular design, which allows it to be easily customized and built upon. For Support & Queries, please mail us at contact@hencework.com . We will get back to you in 3 working days. -Responsive-DataTable page added(Responsive Extension added). - Enhanced UX of Chat app. - Tab responsive design fixed. Bower – A package manager for the web. Note : Images are not included in main source.